I'm continuing a recent trend this week, by playing Roger M. Wilcox's fourth fifth adventure game, only recently restored and converted to Windows. (Interstellar War, which I recently covered, was actually the ninth in this series, not the fourth as reported at the time.) 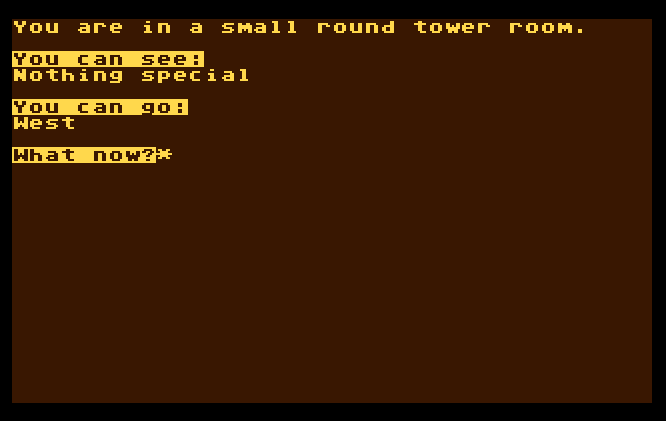 These straightforward adventures were written mostly for the amusement of Mr. Wilcox and his friends, but they're entertaining examples of the early text adventure, starting life on the TRS-80 circa 1980 and ported to Windows in recent years. And with this latest conversion, he's updated his Windows code so we can now load a saved game without having to restart the executable! Much appreciated, Roger. We begin in a Nuclear Submarine (naturally) with a closed hatch on the floor that, oddly enough, requires a key for opening. An airlock chamber to the east (there is no port or starboard directional navigation implemented on this sub) contains a copper key and a red button. The copper key, surprisingly, opens the hatch, allowing access to the Score Room where the sailors bring any hot manatees they happen to pick up... oh, no, it's actually the traditional drop treasures and say SCORE area. There are 6 treasures to pick up, making this game a more traditional treasure hunt than I was expecting given the setting. We can also acquire some scuba gear and a spear gun here. 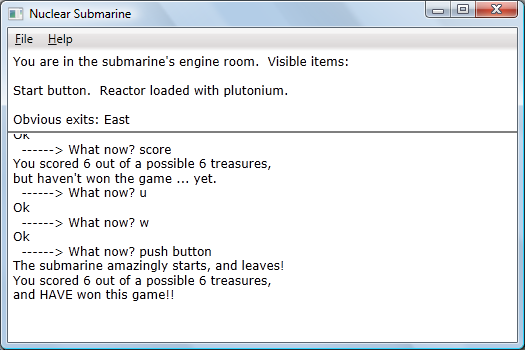 The engine room contains an empty reactor with a Start button that does nothing at the moment. We'll have to get our hands dirty with some nuclear fuel, it appears. Actually, we probably shouldn't use our hands, but we'll see how the story develops. PUSHing the red BUTTON in the airlock chamber without wearing the scuba gear first proves immediately fatal. 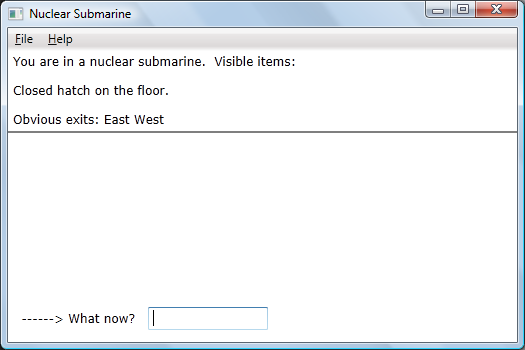 With proper gear, we can enter an underwater area that conforms to traditional adventure game navigational conventions. Below the airlock we encounter a nicely gender-neutral =Person-eating shark= that will not let you pass! but is otherwise politely refraining from eating our person, giving us time to SHOOT SHARK with the spear gun. There's an underwater treasure room below, with an * Imitation treasure chest * that nevertheless counts as a treasure. There's also a cave with a pressurized air room containing a wall mirror and a curtain of darkness. We can BREAK MIRROR -- With what? (the prompt appearing in a popup window) -- GUN, creating a new hole to the north that lets us pick up a lit lamp. Now we can GO DARKNESS to find ourselves in the first dark room, where a * Simulated diamond necklace * sparkles. An enchanted room to the west contains a Blaster wand. This comes in handy in the Big Room where there's a Cave in on the ceiling (Lionel Richie would perfect this concept some five years later.) We can WAVE WAND and it disintegrates the cave-in, allowing us to travel upward. The Room of Valuable Weaponry above the Big Room contains a * Plastic dagger *, also a treasure though its antiquity is in serious question if you ask me. East of here is the Room of "Spring" with a trampoline that proves quite portable. If we try to JUMP TRAMPOLINE in the cliff room, You're smashed to bits from the fall! You're dead! So that's not good. We can DROP TRAMPOLINE and then JUMP, which produces the same result, but if we THROW TRAMPOLINE instead, it drops off the cliff's edge. We now land safely on the trampoline below if we JUMP. Here at the bottom of the cliff is a small shut oyster which can't be moved. The "Tehran" room to the east contains an * Iranian rug *. To the west is a rusted gateway -- the copper key apparently fits it, but it's rusted shut and the blaster wand does nothing to help with that. We can SEARCH in any room, but the only place where that seems productive is in the Tehran room, where we find a passage going east to a Secret Room containing a Can of None-In-1 Oil. We can now OIL GATE and OPEN GATE to reach the Treasure Room, with a * Collection of counterfeit coins * and a Curtain of light leading to a twisty cave maze, to be mapped in the traditional fashion. The maze contains a Piece of radioactive plutonium, and there are some lead tongs in a dead end room. 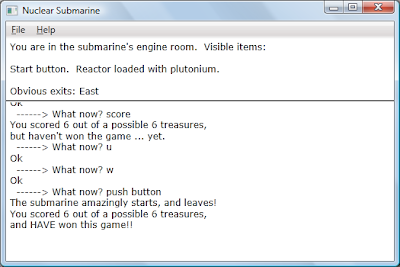 If we put the plutonium in the reactor (an action presumably requiring the tongs, I didn't try to pick up the plutonium without them) and PUSH BUTTON, the submarine starts and leaves! We don't have to have collected all of the treasures, even. But we should try to do this right, so we can take the * Plastic dagger * to the oyster and use it to OPEN OYSTER. A * Cultured pearl * pops out and rolls to the west, where it can easily be collected. With 6 treasures in hand, we fire up the sub's reactor, and victory is satisfyingly ours! That's the end of this one -- none of Wilcox's adventures I've played to date are particularly difficult, but this one didn't require me to dig into the code to work out any puzzles, so either the author's style was developing, or I'm getting more used to it. I have to go back and play his actual fourth adventure, Space Traveller, now that the numbering is straightened out. -- Roddy McNeill's Coo Chew Games has remade the old Spectrum adventure game Artic Adventure A: Planet of Death for the iPhone/iPad. The text is fleshed out nicely, and the wheel-based verb/noun/target selection makes for fairly convenient adventuring on platforms without a physical keyboard. He's recently patched it to fix a crash bug in the initial release, and it's an inexpensive release. It's available in the iTunes store -- details here. -- A new episodic adventure arrived on Steam this week, courtesy of the Greenlight channel -- Cardboard Computer's Kentucky Route Zero. Its visual style and soundtrack are intriguing. My only concern is whether this as-yet-unproven publisher will see the project through -- the game is being sold as a season pass up front, with Act One available now and four more slated for release during 2013. This kind of thing can certainly be done -- I just hope the game sells well enough for its creators to do the remainder of the saga justice. -- The long-lost Leisure Suit Larry 7: Love for Sail, missing from the most recent Sierra animated adventure game compilations, is now available for $5.99 at GOG.com. We begin in a jungle full of dead foliage, and in short and linear order we must climb a tree, GET VINE and SWING VINE -- In the distance, you can almost hear Ron Ely yodeling. I had to look this pop culture reference up -- Mr. Ely played Tarzan on a 1966 NBC TV series. We shortly find ourselves in a desert wasteland. There's a big pile of rock here, and, disturbingly, the Lower half of a body to the north, from which we can liberate a wrench. We can't PUSH ROCK (Oh, stop being weird), but we can KICK ROCK to cause a landslide. This leads into one of Wilcox's more original puzzles -- we end up buried in a pile of rubble, and can't GET UP (I don't get it) or GET DOWN (... and boogie! ), but we can DIG to make our way out. 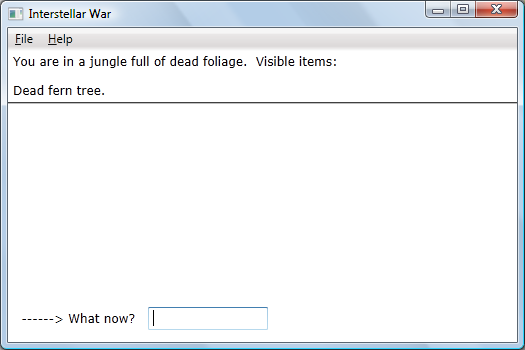 We can now enter a decimated village, where, tellingly, The decimation seems to have been caused by a single weapon. We can explore a shallow pond to the north, and the outskirts of the village to the south. Here we find the other half of the aforementioned body, formerly belonging to somebody who was killed while trying to pull a lever. The dead body has bled the lever in place, so we will probably have some grisly cleanup to do. A metal building east of this mess contains an odd contraption -- a large plastic bag with a valved pouch that we can enter and use to capture air from the current location. Further east, we find an empty bucket, and a sign reading, "Get 'Derelict 2147' adventure for your TRS-80!" in the grand self-promoting adventure game tradition, though that game, Wilcox's twentieth adventure, wouldn't actually come out until 1982, two years after this one was released, with more than a dozen titles in between. We also discover a dangerous whirlpool of sand, reportedly swirling fast enough to grind anything so if we need to destroy something this may come in handy. A twisting road east of the village has a sign reading, "Warning -- dangerous gasses [sic]. Do not enter." This is a challenge we can't pass up, so we'll use the plastic bag -- getting in and closing it first, then entering the ammonia-filled Jovian area, and sucking some air into the pouch with a quick TURN VALVE. I spent some time trying to figure out how to tell the parser to mix the pouch's ammonia gas into a bucket of water, until I realized I had to enter the pond in the bag, and release the gas there with another turn of the valve. This turns the pond into a puddle of ammonium hydroxide, good for cleaning, I hope. We can now EMPTY BUCKET (POUR is not a recognized verb) and the blood-soaked lever is cleaned, but still rusty. Here, it gets a little strange -- we can't use the wrench to force the lever to move, but we can drop it in the sand whirlpool to turn it into a liquefied wrench, then carry it in the bucket and EMPTY BUCKET again to oil the lever. But there aren't many other options available at this point, so this isn't too hard to figure out. Pulling the lever results in a blinding flash of light, and now we are at a plastic four-way intersection, a new section of the map not apparently connected to the other. A storage room to the north contains a number of potentially useful items -- an empty magnetic bottle, some field-charged tongs, a lightning rod, and a suit of hardened titanium armor. A room-sized vacuum oven to the east can be used to... presumably... do something to something else, involving lots of heat. 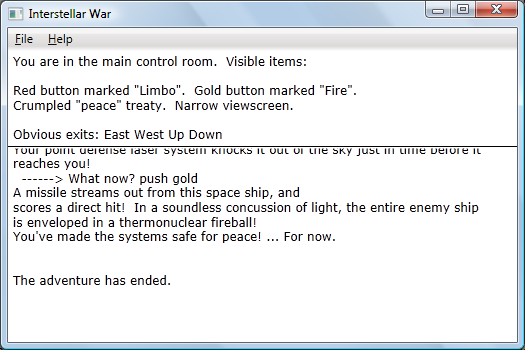 The main control room features a red button marked "Limbo," a gold button marked "Fire," a crumpled "Peace" treaty, and a narrow viewscreen. The peace treaty was for naught, and written for tongue-in-cheek comedy -- "We Alpha-Centaurians and humans agree to terms of peace, even though we want to tear each others' throats out. Signed, James Carter Holsteader." In case we missed the point, we are informed that Both signatures appear reluctant, using our character's hidden talent for handwriting analysis, apparently. The engine room contains a window into the engine, a large knob and valve, and an empty drive box we should probably try to fill. Experimenting, I TURNed KNOB and a stream of fusile deuterium shoots out from the engine, and is instantly pulled into the magnetic bottle. Hmmmmm, interesting. There is, of course, a transporter room west of the control room, with a white button marked "Transport." We push the button, enter the transporter, and are sent back to the village, so we can travel back and forth as needed. Above the control room is a viewing chamber, offering a perspective on Your decimated planet, and below is a computer room with a Chip shunt, probably for computer chips as opposed to, say, Pringles. Can we cook the fusile deuterium in the vacuum oven? We can, but the heat comes out! You're fried! So that's not a good idea. Hmmmm. This actually happens whether we've put anything in the oven or not, and the control room buttons don't seem to influence it. It seems like we ought to be able to close the oven door to keep the deadly heat in, but in my initial attempts I discovered that the published code had a bug! 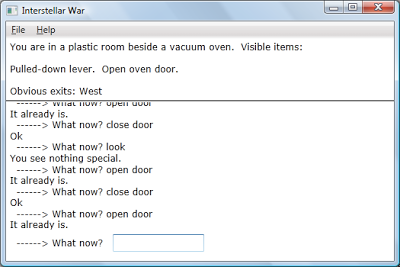 It reported "Ok" when I tried to CLOSE DOOR, but it actually kept the Open oven door in the room, making it impossible to finish the game. But all was not lost -- Mr. Wilcox has provided us with his source code, so I was able to confirm that the verb_open code is identical to the verb_close code, causing the problem I was seeing. I contacted the author to see if this could be fixed -- assuming I would have to set this one aside for a while -- and Mr. Wilcox responded with alacrity, fixing this issue the same night I reported it! Thanks, Roger! With the oven door closed, we can safely turn it on. If we drop the armor in the oven, though, The mummy won't let you leave! What mummy? This must be code left over from another game, though none of the author's games I've sampled so far seem to feature a mummy. And none of the items we are carrying seem to be impacted by a trip through the oven, so I really didn't get anywhere with this sub-adventure. Hmmmm. Time to do some experimenting. We can die by opening the oven door while it's on, or by trying to get more fusile deuterium from the engine room. Ah -- with the titanium armor on, we can survive in the sandy whirlpool and acquire a piece of silicon! Cooking the silicon in the oven adds some Transistor crystals to the room (the silicon remains there too.) And now we can somehow manually MAKE CHIP from the silicon and crystals -- take that, Intel! Now we can INSERT CHIP in the computer room's chip shunt, and the control panel buttons become active. The red button produces a mechanical voice response: "No drive fuel." 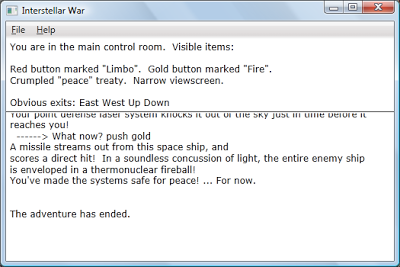 PUSH GOLD fires a missile that travels harmlessly into into [sic] space at the moment. Trying to INSERT BOTTLE to fuel the drive with fusile deuterium initially seems like futile tedium. I had to look at the code to figure out that we have to do something with the lightning rod before we're allowed to do this. We can THROW ROD to bring a lightning bolt down to earth, to no apparent effect. But if we first drop the bottle with fusile in it, then the bolt ends up in the bottle as well and we now have a Reverse-charged bottle. With the field-charged tongs in hand, we can GET BOTTLE and INSERT BOTTLE into the drive box, so that it is now loaded with antimatter. Quite how this works I don't understand given my limited physics knowledge, but this is a good thing -- whew! PUSH RED in the control room now takes us through a tunnel of space-time at the speed of light. And now the viewing chamber shows us a Barnardian planet, and an Alpha-Centaurian space ship. We will assume the Alpha-Centaurians are the bad guys who decimated our planet, given the lack of any other information about their culture or role in galactic society during this time of Interstellar War, and start firing by PUSHing the GOLD button in the control room. A few attempts, and we've defeated the (local) enemy fleet! This one was a little more complicated than the author's earlier efforts, with a couple of interesting mechanical puzzles, although I can't say they all made a lot of sense. Thanks very much to Roger M. Wilcox for making his old adventure games available in convenient Windows format, and for being so quick to fix the bug in this one! 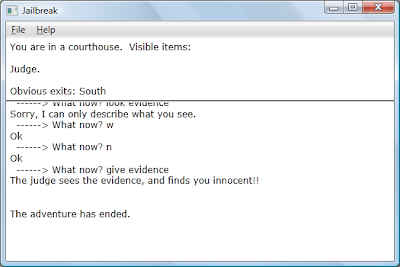 -- Scott Adams' new text adventure, The Inheritance, is out and available at his official website. I've only played the demo version so far, but from what I've seen it's the classic Adams style with fewer technological limitations. I'm very much looking forward to digging into it. -- Double Fine's heavy metal tribute Brutal Legend is coming to the PC via Steam in the not-too-far-off future. The game didn't do particularly well at retail on consoles, but it's a playable and highly entertaining fantasy, with a visual style like a 1980s Iron Maiden album cover come to life. -- Falcom's PC version of Ys I & II Chronicles+ is now available on Steam, as a hybridized version of the 2001 and 2009 PC ports. The brilliant Yuzo Koshiro score is available in several different mixes, the gameplay and visuals are updated and expanded but recognizably intact, and I'm thoroughly enjoying returning to the world of Ys. 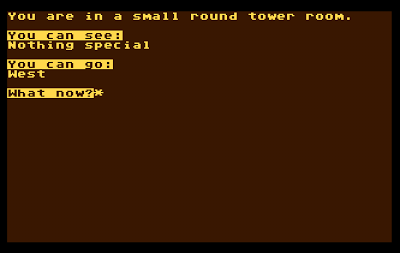 Also, I've received word from Roger Wilcox, whose PC ports of his early TRS-80 text adventures I've recently been playing, that with some new tools in hand he has managed to recover most of his "lost" games from aging audio cassettes. New Windows versions are expected in the future, as his time permits. This week, we're tackling Jailbreak, Roger M. Wilcox's third TRS-80/Windows adventure, originally written in 1980 and converted to Windows in 2012. 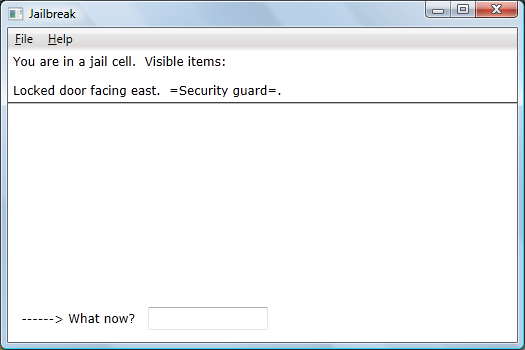 This one, as the title suggests, is a prison-escape adventure, and it's very straightforward. 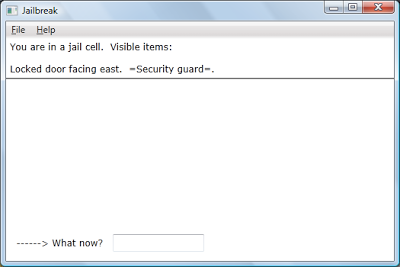 Jailbreak begins with less preamble than Wilcox's earlier games -- we're in a jail cell, behind a locked door, with a =Security guard= and nothing in inventory. KILL GUARD yields Be more specific as to how. CHOKE GUARD, HIT GUARD, KICK GUARD and STRANGLE GUARD don't work. PUSH GUARD returns You can't press a "guard"! We can't UNLOCK DOOR because, of course, You have no keys! There are no EXAMINE or SEARCH results available. There aren't many options at all at this point in the story, so I finally tried HELP and received The hint is "ventriloquism." And yes, THROW VOICE works -- The guard, hearing the sound, runs to the north. In doing so, he drops his keys. Remarkably sloppy security in this place, it seems. Now we can access a long hallway. There's a roll of money in an office to the south -- not sure what sort of prison this is -- and of course the security guard is still lurking about at the north end of the hallway. GIVE MONEY yields, mysteriously, That is one thing that can't be shown -- so GIVE must be a variant of SHOW as far as the parser is concerned. BRIBE GUARD is not recognized, nor PAY GUARD. LOOK in the office yields Search and ye shall find. SEARCH discovers an eastbound secret passage. 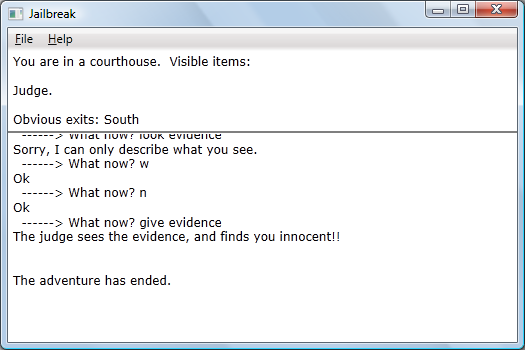 (SEARCH OFFICE does not work, however.) The secret passage leads to the Arms Room where a loaded revolver is available. We SHOOT GUARD, and The guard, unprepared for the attack, dies -- also odd, since we spent quite a bit of time loitering around behind his back, thinking about ways to kill or bribe him earlier. 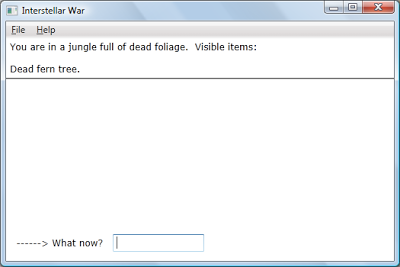 SEARCH GUARD produces You found nothing special. Maybe you should frisk him. FRISK GUARD reveals a small button on his belt. We PUSH BUTTON and You hear a small whir from the east. To the east is the Round Room, where we find a disguise kit and an open wall to the east (likely opened by the button on the guard's belt.) We can WEAR KIT to be disguised, and WEAR BADGE found in the next room also. Next, we arrive in the Warden's Office, where the =Warden= blocks passage, except with the disguise and badge on he presents no obstacle. With the keys we used earlier, we can unlock the prison's exit door. Wilcox wrote a number of these early games in a short period of time, and most of them are simple. Jailbreak is actually even simpler than his first two, but I enjoyed playing through it as a quick evening's diversion and I will continue to work my way through his surviving games. I was in the mood for something not found on my to-play list this week, and some random searching came up with Demon Adventure, written by Adrian Cox and published by Page 6 back in 1988 for the Atari 400/800 home computers. Page 6 was a United Kingdom magazine that also collected the Softside Adventures on disk, billed as "Super Adventures", so we might expect this non-Super offering to be a bit simpler. The plot of Demon Adventure is straightforward -- the player is trapped in the Duke's castle by a hideous demon, and must find a way to destroy the demon and escape. We begin in a nondescript small, round tower room, with nothing in inventory; this room adjoins a spiral staircase that leads up to the tower's roof, where a signal fire burns, and down to a long upper hallway. A storage room contains a crate which can't simply be OPENed. A panelled room bears claw marks, evidence of some great beast, likely the titular Demon, and a wooden chest that's easy to open, revealing a note reading: "It is very close." Another room is burnt out and otherwise empty, obviously damaged by fire, though we aren't encountering the creature just yet. The main bedroom contains a bed, naturally, and if we try the usual adventurer's gambit and attempt to MOVE BED, the expected secret passage is revealed, leading down. It's too dark to see what's down there at the moment, though, so it's fortunate that the map is logical and U takes us back to the bedroom. The long hallway in the center of the building leads to another tower, this one with birds visible overhead from the roof. A lower level contains a banquet room with deep grooves cut in the floor -- demons do not make good houseguests, it seems. The adjoining kitchen contains a metal bucket and a table, upon which a knife can be discovered with further EXAMINEation. A courtyard is surrounded by the castle walls, confirming the sort of structure we find ourselves in. There's a well here, down which we can FILL BUCKET (GO WELL yields Don't be silly, but we can just go D.) West of the courtyard is a gate with a portcullis; the roof of the gate tower above features a metal pole, a lever, and a grey substance. If we are tempted to PULL LEVER, the grey substance reaches toward you. You are dead. But we can take the pole with us easily enough. We POUR WATER and the grey substance "runs away" so we can PULL LEVER... oh, wait, no, it is apparently only the water that has run away, as we're still killed by the grey substance. Darn that lack of antecedents! There's a library in the southern end of the castle, sporting an ancient book and a wooden shelf containing a parchment scroll. The book informs us that a demon must be destroyed by magic, in case we thought we could just call Orkin. The scroll says, "Throw the remains of fire, burn the means of flight, then say the word 'Mittam', To keep him out of sight." It's the usual sort of adventure game magical recipe, suggesting that nobody really needs to master any wizardry to handle these DIY projects. There's also a weapons room containing a bow and a single arrow, so we'd better make it count. We have a six-item inventory limit, which is now starting to get a little tight, but at this point it looks like we've mapped out the castle and found all of the obvious items. So let's see what we can do to move the story along. Pouring the water on the signal fire atop the southern tower puts it out, producing some ashes, so that should be helpful per the spell. The crate can be SMASHed if we have the metal pole, revealing another secret passage and producing a piece of wood... which would probably make a good torch had I not just put out the signal fire. So it's time to restore to an earlier save and try again... yes, that works, so with our blazing torch in hand we can check out both secret passages. The one below the bedroom leads to an escape tunnel blocked by a rockfall, with a spade in it. The secret passage below the storage room leads to a cellar with a chalk circle all ready to go -- or it would be, if the circle were not already broken -- adjoining a maze of sticky red walls. The maze is fairly small, just three rooms with the usual confusing connections. The only important room has a grey "almost alive" curtain, and it seems like the game's finale will occur somewhere in this area. But we have more puzzles to solve first. We can SHOOT BIRD from the top of the northern tower to kill one of them -- does this have something to do with the "means of flight"? We can CUT CURTAIN -- it shrivels and disappears, allowing us to go north to the lair of the demon, where the Demon himself is waiting motionless among some human bones. We THROW ASHES, and then... well, we can't BURN BIRD, but we can PLUCK BIRD and then BURN FEATHERS. Unfortunately, it's not going to be this easy. As soon as we burn the feathers in the lair, the demon is woken by the spell and moves towards you... You are dead. What we can do is throw the ashes in the demon's lair, which wakes him up, and then run... but he still catches us within a few moves. Actually, the demon wakes up as soon as we leave his lair, it doesn't have anything to do with executing the spell. So we need some protection, it seems. We can't REPAIR CIRCLE --- What with? -- SPADE. But maybe we can DIG with the spade to find some chalk or something -- and yes, there's some buried in the courtyard near the well. Now we can fix the circle and GO CIRCLE... and... now what? We still don't have time to run back to the circle after we begin the spell. The symbol on the book's cover shows a circle with 8 arrows radiating out from it, but I'm not sure that means anything. Oh, maybe I was forgetting to fix the circle... nope, the demon still catches up too quickly, and there aren't any walkthroughs available online, so it's time to go into meta-adventure mode, dig into the BASIC logic and see what I'm missing. Looking at the code, I can't quite figure out what triggers the demon; it seems he only has two states, immobile or murderous. Feathers are object 2, ashes are object 7. I learned the following: If we burn the feathers in the demon's lair, it wakes him. If we burn them in the chalk circle, something else happens. So that's a clue, it appears we need to burn them within the circle. The Demon is object 20, DROP is verb 7, which in this game is not the same as THROW, verb 23. It looks like we need to THROW ASHES while we're in the circle and BURN FEATHERS there too. Oh, wait, do we need to THROW BONES in the lair? Or BURN BONES? Nope, but I did confirm that CP = 33 when we're in the chalk circle. So how does the DF variable shift from -1 (demon immobile) to DF>0 (demon active) to DF=0 (we're dead if we're not in the circle)? This variable goes to DF=2 first at line 1290 which is a GO verb. So yes, GO SOUTH to leave the demon's lair triggers him into action. There doesn't seem to be a good route to get back to the chalk circle in time after triggering the demon, though. Aargh! So I finally cheated, or debugged in my opinion, editing line 1290 to set DF=6 instead of 2. This bit of counter padding gives us enough time to go back through the maze by the most efficient route and get safely inside the chalk circle (actually, DF=5 is sufficient). And now -- hmmmm -- it seems the recipe is slightly buggy? We have to BURN FEATHERS first, then THROW ASHES, then SAY MITTAM -- and now, at last, the demon fades from sight and disappears. 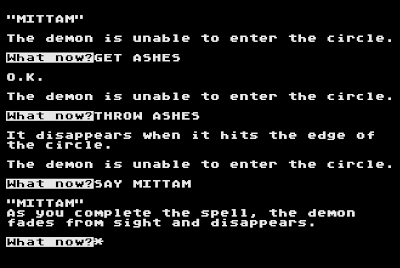 Actually, that's not quite it -- the order of the steps doesn't in fact matter, but we can't even successfully execute the intended first step (THROW ASHES) until DF reaches zero and the Demon is in the room, reportedly unable to enter the circle. My extra step on the counter gave me one move to be confused as the spell still didn't seem to be working. 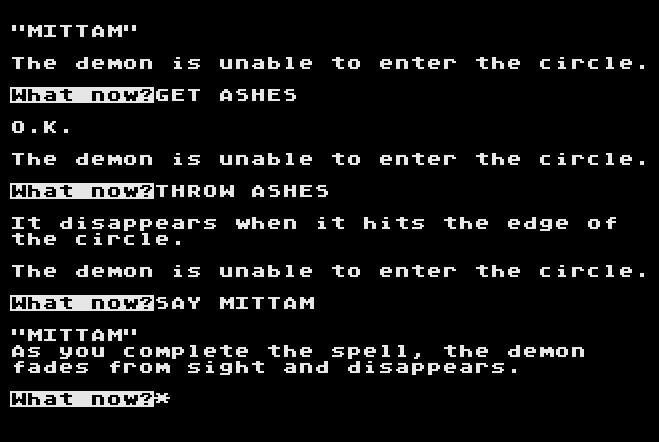 I'm pretty sure that Demon Adventure as I found it is not quite winnable -- I checked the map data, and there seems to be no way to make it from the Demon's lair to the chalk circle within the 2 moves allowed; at least 5 are needed. I didn't come up with any magic words or objects that can spirit us instantly back to the circle or anything, and the endgame design requires the demon to reach the chalk circle room before we can cast the spell; in fact, we can completely waste the feathers by BURNing them before the demon is present. So it seems that breaking into the code to correct line 1290 is in fact required, a bug of sorts that made this otherwise straightforward adventure a bit frustrating. I'll chalk it up to a lack of playtesting due to Page 6's publishing schedule, or inexperience on the author's part, and hope for better things next time!